2014-2016 Ram pickups are among the 104,000 U.S. vehicles suspected by the EPA of containing software allowing excess diesel emissions. 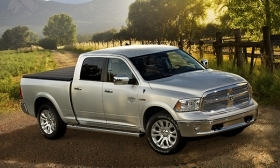 Pictured is a 2014 Ram 1500 eco diesel. WASHINGTON -- The EPA has accused Fiat Chrysler Automobiles of using software that allowed excess diesel emissions in just over 104,000 U.S. pickups and SUVs sold since 2014. The maximum fine, in theory, would be about US$4.6 billion. California Air Resource Board Chairman Mary Nichols said: "Once again, a major automaker made the business decision to skirt the rules and got caught." Fiat Chrysler CEO Sergio Marchionne, during a call with journalists, angrily denied the company was cheating and has been in talks with EPA and made significant disclosures of documents. "We have done nothing that is illegal," he said. "There was never any intent of creating conditions that were designed to defeat the testing process. This is absolute nonsense." He added: "There's not a guy in this (company) who would try something as stupid as (cheating on diesel tests) ... We don't belong to a class of criminals." FCA said in a statement: "FCA US is disappointed that the EPA has chosen to issue a notice of violation with respect to the emissions control technology employed in the company's 2014-16 model-year light-duty 3.0-liter diesel engines. FCA US intends to work with the incoming administration to present its case and resolve this matter fairly and equitably and to assure the EPA and FCA US customers that the company's diesel-powered vehicles meet all applicable regulatory requirements." An automaker can use an auxiliary emissions control device in limited circumstances to protect the engine from damage, but it must be declared to regulators. FCA's U.S.-listed shares initially plunged as much as 18 per cent on the news. As of 12:26 p.m. ET, the shares were still down 12 per cent to US$9.73. The EPA's announcement comes amid rising scrutiny by the agency of automaker emissions after Volkswagen AG admitted to cheating diesel emissions tests in 580,000 U.S. vehicles. EPA has reviews ongoing of other automakers' emissions systems, but it is not clear if they have found any additional wrongdoing. In April, Daimler AG said the U.S. Justice Department had asked the carmaker to investigate its emissions certification process for vehicles including its Mercedes brand. The EPA has for months declined to certify Fiat Chrysler's 2017 diesel vehicles for sale in the U.S., but the automaker has continued to sell 2016 diesel models. In September 2015, EPA said it would review all U.S. diesel vehicles following an admission from VW that it installed software in cars allowing them to emit up to 40 times legally permissible level of pollution. On Wednesday, VW agreed to pay US$4.3 billion in criminal and civil fines and plead guilty to three felonies for misleading regulators and selling polluting vehicles. The probe covers FCA's diesel trucks and SUVs from the 2014-16 model years. "Chrysler’s alleged misbehavior -- rigging its trucks, VW-like, to increase pollution of our lungs and lying about it -- is appalling," Dan Becker, director of the Safe Climate Campaign, said in an e-mailed statement. Automotive News staff and Bloomberg contributed to this report.